Reading the stories of Creation is particularly appropriate at this time of year: Tishrei is the first month of the modern Jewish calendar, school and other community activities re-start now, and even the start of the Federal fiscal year has been kicked down the road into autumn. The stories in these first chapters – mainly Creation, Garden of Eden, Cain and Abel (note that Ch. 4 9 “am I my brothers keper?” is another Tyndale translation), and multicentenarians, until the human life span is reduced to 120 years – can be viewed from a variety of angles: dogma, unifying national myth, literature. In Hebrew school, I even heard a rabbi suggest that maybe the brevity and simplicity of Creation in Genesis was in reaction to (or a parody of) the elaborate creation tales spun by other peoples. By the end of this week’s Torah portion, the Lord is unhappy enough to flood the earth and start all over. Tune in next week. thereby creating heaven and earth on a first day. e) separating water from sky on a second day. wherein steps f) and g) are performed on a third day. 4. The method of claim 3 wherein the vegetation comprises seed-bearing plants of every kind, and trees of every kind bearing fruit with the seed in it. wherein steps h) and i) are performed on a fourth day. j) creating water animals and winged birds on a fifth day. wherein steps k) and l) are performed on a sixth day. 8. The method of claim 7 wherein the land animals comprise cattle, creeping things, and wild beasts. 9. The method of claim 7, wherein the at least one human is in charge of all animals and vegetation. l) resting on a seventh day. 11. A heaven and an earth produced according to the method of claim 1. 12. A plot of dry land produced according to the method of claim 3. 13. An item of vegetation produced according to the method of claim 4. 14. A greater light produced according to the method of claim 5. 15. A lesser light produced according to the method of claim 5. 16. A water animal produced according to the method of claim 6. 17. A winged bird produced according to the method of claim 6. 18. A land animal produced according to the method of claim 7. 19. A human produced according to the method of claim 7, wherein the human is male and/or female. “What’s a man?” asked Eve. longer needed God. So they picked one scientist to go and tell God that they were done with Him. The scientist walked up to God and said, “God, we’ve decided that we no longer need you. scientist said, “Sure, no problem” and bent down and grabbed himself a handful of dirt. 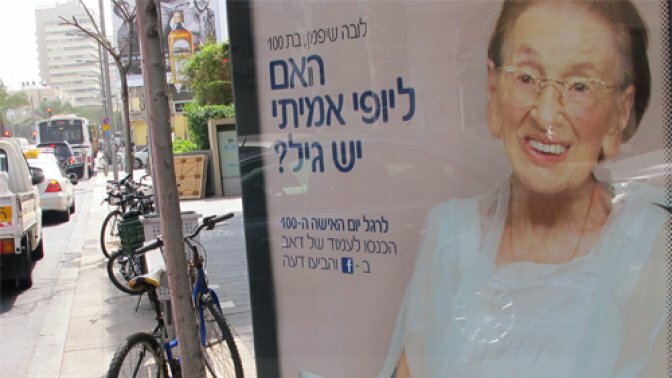 She will soon celebrate her 100th birthday, but Luba Fishman has found a new career – as a poster woman for an international cosmetics company. The Latvian-born, Israel-domiciled great-grandmother was chosen as a new face for Dove Cosmetics’ “real beauty” campaign, with the slogan “Does true beauty have an age limit?” The company says the campaign is designed to avoid “beauty stereotypes.” Luba was born in Latvia in 1912, and moved to pre-state Israel in 1932. Her unlikely career as a model began when an executive at an advertising agency received a request for help to find a 100-year-old model. The executive immediately thought of her husband’s grandmother, and Luba, when asked, burst out laughing, explaining that she was not at all photogenic. Assured that the photography would be of a high professional standard, Luba gave her assent.